The value chain of the global nuclear waste management market consists of numerous global players. The vendor landscape of this market is therefore highly competitive, with companies such as Areva SA, Veolia Environment Services, Bechtel Corporation, US Ecology, Inc., and Augean Plc., emerging as the most prominent players. These companies exhibit a wide nuclear waste management services portfolio. Among the aforementioned companies, Areva SA emerged dominant in the market on account of generating more revenue in the nuclear waste management business than its competitors. Bechtel Corporation and Veolia Environmental Services emerged as the second and third leading companies in the market, respectively. The top three companies together held a share of nearly 75% in the global market in 2014, finds Transparency Market Research (TMR). By waste type, these companies are mainly engaged in efficiently disposing high-level waste (HLW) generated in nuclear power stations. The segment accounted for a share of 35.9% in the global nuclear waste management market in 2015. Nuclear waste refers to residues or materials left after nuclear fuel is burnt in reactors. These residues mainly include radioactive materials, known to cause radiation sickness. The increasing population and the subsequently rising demand for electricity, the growing dependence on fossil fuel, and the rising awareness regarding the benefits of energy derived from alternative sources are primary factors boosting demand for nuclear waste management services. On the flip side, the high initial investment required for these services and their high payback time are inhibiting the growth trajectory of nuclear waste management to an extent. Nevertheless, TMR projects the market to considerably benefit from the implementation of stringent emission control norms. Among the nuclear reactor types, the market is expected to witness the highest demand from the pressurized water reactors segment. Demand from the boiling water reactors segment is expected to be the second in line. As per TMR analysis, the pressurized water reactors segment held the dominant share of 69.3% in the market in 2015. “Demand for nuclear waste management services is expected to increase at a robust pace in the near future,” revealed an analyst at TMR. “Since these reactors can operate in lower fuel temperature and require lower pressure, their installations are expected to increase, thus boosting demand for nuclear waste management at the highest pace,” he added. 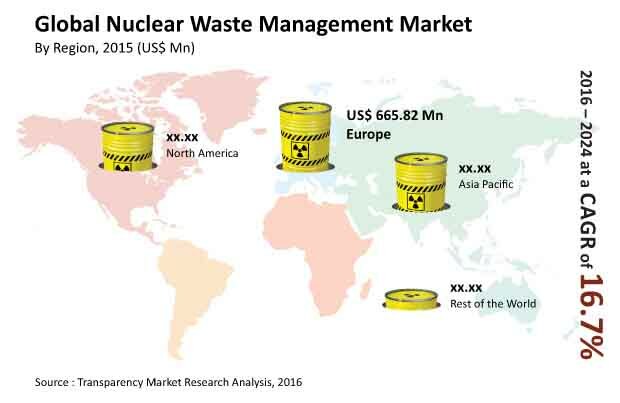 Regionally, Europe, Asia Pacific, North America, and Rest of the World are the key segments of the global nuclear waste management market. Of these, Europe is currently exhibiting the most attractive opportunities for nuclear waste management, followed by Asia Pacific. These regions together account for the largest number of nuclear reactors in the world, which makes them the most lucrative regions for vendors offering nuclear waste management services. In 2015, the market for nuclear waste management in Europe accounted for a share of 41.3% in the global market, states TMR. The investments in nuclear power projects in Europe are expected to surge exponentially in the forthcoming years, thus bolstering opportunities for nuclear waste management. North America however is expected to report moderate prospects for the market due to the shale gas boom in the region. Nevertheless, Asia Pacific is expected to emerge as the fastest growing market for nuclear waste management with China planning to double its existing nuclear capacity by 2020. As per TMR growth opportunities for the market reported by Asia Pacific is expected to surpass that of Europe’s by 2024. As per TMR findings, the global nuclear waste management market is forecasted to exhibit a CAGR of 16.7% from 2016 and 2024. The market is projected to reach US$5,627.5 mn by 2024 from a valuation of US$1,382 mn in 2024. The review is based on report, titled “Nuclear Waste Management- Global Industry Analysis, Size, Share, Growth, Trends, and Forecast 2016 – 2024” published by Transparency Market Research.